New windows for the grinder's menu and combat scripts. The menus are simplified and better arranged now. Fixed an annoying bug with timers that froze the bot/combat scripts when using it for the first time. I've added some functionality, made it easier to use auto path. Added more target creature selections. It's only been tested with the latest oGasai 2.1.23. So I've included the .dll in a .rar archive. The file coremenu.lua is also included, so be careful not to overwrite your own if you wish to save it. I will post and update all my scripts for the new framework in this thread. Be sure to use the latest oGasai version (right now 2.1.12)! Auto pathing enabled by default. It will create path nodes of dead valid mob's locations with 60 yards in between. Move to a hotspot and make sure to increase pull distance. Added hotspots. Generally your start up location will be set as a hotspot. Then you can change Distance to hotspot to grind closer/further away from that hotspot. You can also add static level-range hotspots in script_nav.lua. There is one example there. You can also manually enter walk path file. E.g. paths\1-5 UD.xml If you want a specific path to auto load on start up just edit the pathName in script_grind_logitech.lua. But disable auto pathing to use walk path. Simple vendor looks for vendors in vendorDB.lua in your current zone (you have to add vendors). All items that you had when you started the bot will be saved to a keep list (won't be sold). The hunter script will look for ammo vendor when only 1 stack of ammo is left. (Will buy the same ammo we currently use.) Again you have to add ammo vendors. If a sell vendor can repair it will do that too. See script_vendor.lua for more functions. Basically a copy of my mage script for oGasai 2.0.17, added potion logic. Basically a copy of my rogue script for oGasai 2.0.17. If you have the skill Riposte, put it in one of your action bars for the script to recognize when it's ready for use. Basically a copy of my hunter script for oGasai 2.0.17, added feign death and potion logic. If you don't change the options put your quiver/ammo punch in your most left bag slot and pet food in the second most left bag's last slot. Basically a copy of my warlock script for oGasai 2.0.17, added use of healthstone and potions. Basically a copy of my warrior script for oGasai 2.0.17, added use of potions. I've never played a paladin but I think I understand the rotation by checking out Zerger's basic pala script for 2.0.17. I've added LoH, BoP, Divine Protection and potion logic. Combo logic for HoJ -> SoC -> Judgement. Simple priest script uses: renew, shield, all heals at different thresh holds, smite, shadow word pain, mind blast and the UD damage spell. Fears with Psychic Scream if more than one enemy attacks us. Uses the wand a lot. Much can probably be added to this script, e.g. Shadowform logics. Pulls with lightning ball, attacks with Stormstrike. Uses Earth Shock when the target uses spells. Buffs with Lightning Shield. Simple druid script for cat form. Should work from level 1-60. I've tested it from level 1-10 and on a 60 druid. Using heals: Healing Touch, Regrowth, Rejuvenation, Buffing Mark of the Wild, Thorns, Tiger's Fury. If you just want a good working script I suggest you to use oGasai 2.0.17 and the scripts in the rotation sections. While you are swimming your speed changes, maybe you can use that for swim detection. Edit: Just updated the hunter script, now stops on full inventory if enabled. The mage script seems to be working very nice. The only error i have encountered so far, is when my character gets killed by enemy faction, it gives an LUA error (check image), and it wont resurrect. The resurrect works just fine, if its just a mob who kills the toon though. 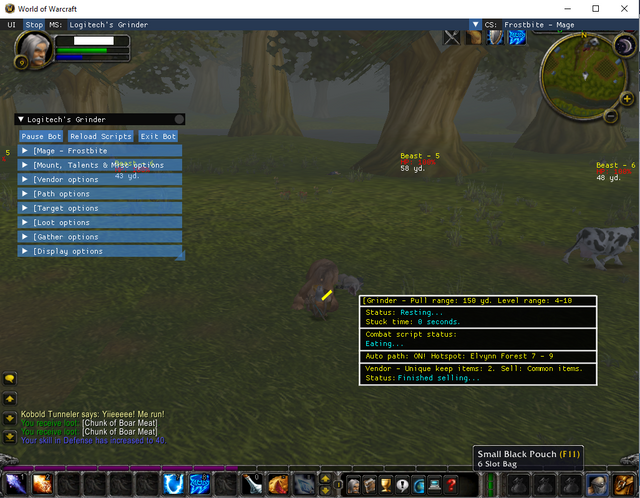 When we detect that the target is a player/pet or totem, we add the target GUID to a black list. For now It displays the GUID for blacklisted targets for debug. Update the grinder and the class script if you want this feature. (12-09-2017, 12:07 PM)kxrxh Wrote: The mage script seems to be working very nice. The only error i have encountered so far, is when my character gets killed by enemy faction, it gives an LUA error (check image), and it wont resurrect. The resurrect works just fine, if its just a mob who kills the toon though. Edit: Updated the grinder script 2017-12-11 13:14, small fix to target selection and paranoid function.